I purchased this 1 gallon jug with a spigot from the thrift store for $2.99. It has red drink related words on it - like punch, mixed drinks, fruit juice and wine. I did a double take at 'wine'. Who would open a bottle of wine and then put it in a jug like this!? 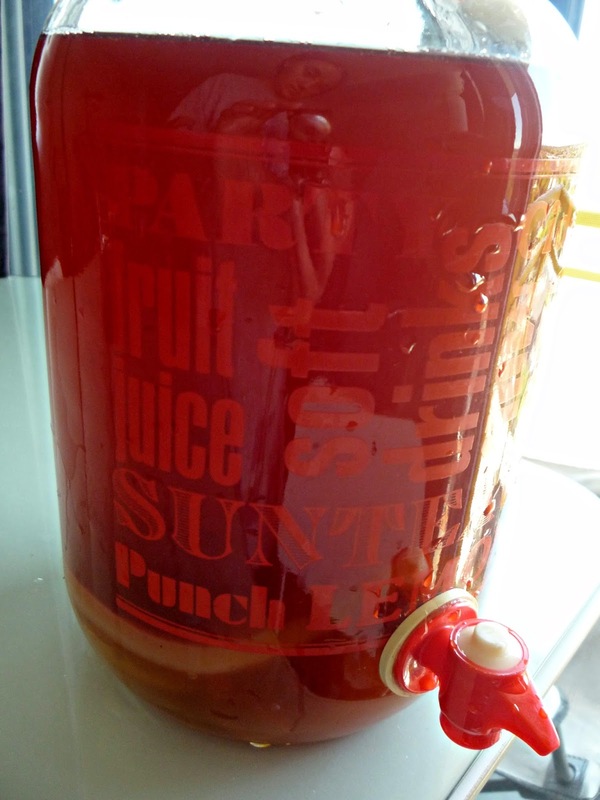 Anyways, I purchased this jug to make set up a continuous brewing kombucha system. Continuous brewing seems like a fairly easy task to accomplish. When you tea is brewed to your liking you draw off 25-30% with the spigot and bottle as per usual. Then you refill with sweetened tea and let ferment again. Easy peasy lemon squeezy. I'll let you know how it goes but in the meantime check out my online course here! It's free! Any advice for a CB (continuous brew) noob?